Whether you are an MSP, VAR, telecom agent or other technology services provider, Tigerpaw One business management software provides everything you need to begin the automation process, increase collaboration, streamline project management, increase cash-flow, expand your sales pipeline through sales automation, minimize costs and improve customer service. Instead of using a variety of software solutions to track and manage day-to-day business operations—or worse, a collection of paperwork, filing cabinets and spreadsheets—you’ll log into a single, user-friendly portal that provides you with quick access to everything you need, all in one place. Whether you are an MSP, VAR, telecom agent or other technology services provider, Tigerpaw One business management software provides everything you need to begin the PSA automation process, increase collaboration, streamline project management, increase cash-flow, expand your sales pipeline through sales automation, minimize costs and improve customer service. Instead of using a variety of software solutions to track and manage day-to-day business operations—or worse, a collection of paperwork, filing cabinets and spreadsheets—you’ll log into a single, user-friendly portal that provides you with quick access to everything you need, all in one place. 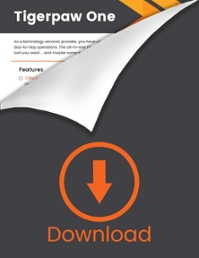 << Download our free Tigerpaw One features list. You’ll see the benefits of Tigerpaw One, the best psa software, across your entire organization—from the upper management team to the field technicians and salespeople. By automating time-consuming processes, Tigerpaw One empowers leadership to focus more time on developing strategies to grow and improve the business. Meanwhile, team members with more hands-on responsibilities will be able to work more efficiently, effectively and improve customer service in the process. Tigerpaw One integrates seamlessly with most RMM tools so you can access real-time information and automatically create service tickets. Tigerpaw One empowers you to build your sales pipeline, focus on opportunities with the greatest revenue potential and analyze what’s working and what’s not. Tigerpaw One offers a variety of time-saving tools to help you stay organized and keep control of projects and materials while reducing costs. Tigerpaw integrates with Quickbooks, Peachtree and others, so you access contacts, account receivables, payments, purchase orders and more. A complete CRM software solution, Tigerpaw One makes it easy to communicate with customers and prospects and track your efforts for effectiveness. With Tigerpaw, you can access real-time data to see everything from business intelligence and financial projections to employee hours and expenses. Sign clients quicker by automating contract and SLA creation with Tigerpaw One. Just enter in the client information and click print or send. Emails that you send or receive in Outlook are logged automatically to the corresponding contact in Tigerpaw One for easier accessibility. Tigerpaw One integrates with all industry-leading RMMs to automatically create service tickets and deliver real-time asset information. Tigerpaw One allows you to automatically generate and distribute invoices based on service tickets, project status and SLAs. Tigerpaw One allows you to easily track and manage your technicians, resources, open jobs and more via a dynamic online interface. Tigerpaw offers complete purchase order workflow, delivery tracking, RMA processing and more through an intuitive interface. Tigerpaw allows you to see available inventory, inventory on order and associated costs so you can better manage your supply chain. Accept automated or one-time payments by processing credit card or ACH transactions, as well as accept payments through an online customer portal. Our Exchange Integrator add-on keeps your contacts, appointments and to-dos synced between Microsoft Exchange Server and Tigerpaw One in real time. Reduce the time spent creating service requests and tracking customer responses with service orders automatically generated from customer emails. Easily manage your remote monitoring, HaaS, SaaS, content filtering, remote offsite backup and warranty agreements with Tigerpaw One. It’s more important than ever to give your technicians the tools they need to complete their work while in the field, as well as provide your customers access to their accounts 24/7. With Tigerpaw One, your field technicians can enter time logs and update service orders on site, eliminating paperwork back at the office and freeing up their time for billable activities. Tigerpaw One also features a Customer Self-Service Portal that lets your customers access their accounts 24/7, open new service tickets, track the status of an existing ticket and more.